The long streak of down days finally came to an end yesterday after twelve straight down days – yesterday was the first day in November that the markets rose. 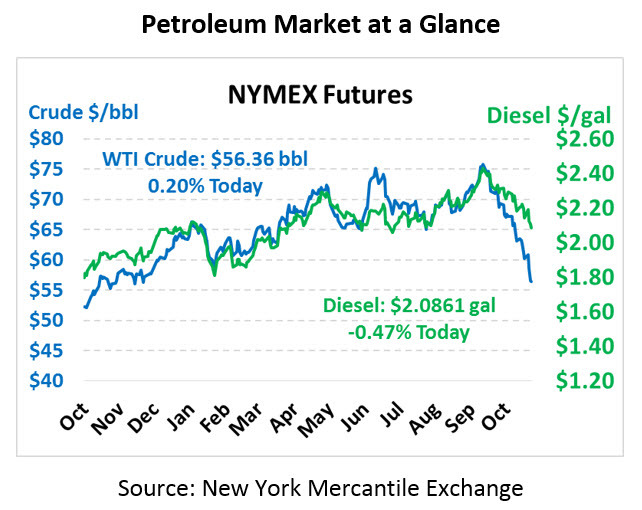 When the streak began, crude prices were over $67/bbl; they collapsed to just $55/bbl by the end of the slide. The steep losses reversed all of 2018’s price gains, and it’s unclear what comes next for oil. Yesterday’s rally was weak at best, with markets rising just 50 cents – certainly not the “snap-back” results some had hoped for. This morning, crude oil is trading at $56.36, up just 11 cents. Fuel prices also received a boost yesterday, after taking a large hit in prices (though avoiding the streak that crude maintained). Diesel prices picked up over 3 cents yesterday, while gasoline was up almost 2 cents. This morning, diesel prices are trading at $$2.0861, a penny loss. Gasoline prices are $1.5574, down a light 0.3 cents. OPEC is now signaling a potential 1.4 million barrel per day supply cut in 2019 leading up to their December meeting to decide 2019 strategies. Yesterday’s cautious rally, though, shows that markets are waiting to see action, rather than just words, before allowing prices to rise again. China also helped boost prices yesterday after demand statistics showed continued strength in Chinese refinery throughputs – showing that their economy is still requiring extremely high refinery activity, putting downward pressure on stocks. The API released their weekly inventory data last night, a day delayed due to Veterans Day. 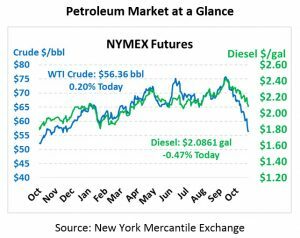 The report showed a hefty build in crude stocks along with a surprise build for gasoline, though diesel continued to show tight supplies.